From this I deduce Baronius has larger font. Is that true? Send me a PM to remind me and I'll pull both out tonight and do some side-by-side pictures for you. Hopefully, you'll post that and not just PM it, even with a PM'ed reminder. I notice that Baronius is easier to read. I tried to get some propers, prefaces, canon, chant notation, and how big they are in the hand compared to each other. My preference is the Angelus. It seems to have less flipping around to get to parts and generally lays in the hand better. However, if you are the type of person who uses holy cards to mark pages, the Baronius (being stiffer due to smaller size) might be more preferable. Of the two, Angelus is better if only for the notes within the Ordinary of the Mass which explain what is going on. Parsimonious, yet full of meaning. I dare say you wouldn't need to read a book on the Mass if you are of reasonable intelligence after studying with that Missal. I own the Angelus and have given the Baronius as a gift. But it would have to be an emergency for me to haul the Angelus to Mass. Much better to use a slim St. Andrew from the late '50s or early '60s without Vespers. And if you really want luxury and convenience get a Sunday Missal and use the slim St. Andrew for other days of the week. Font nearly identical or the same. Angelus has narrower margins. Shout out to James' book! Thank you for the effort. But you know Baronius now makes missals slightly larger than Angelus so the font is definatelly bigger. It does? When did it start doing that? 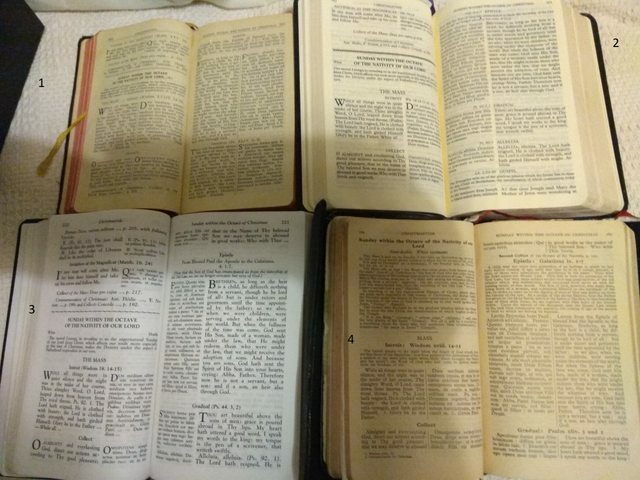 https://www.baroniuspress.com/images/Daily_Missal_browsing/283.html (just flip to "next page" at bottom of browser to get an idea of inside). It looks to me like they took their previous printing size and just stuck it in a larger overall missal, resulting in larger margins. One also still has the problem of the thickness of their missal (really affects how it handles in the hand) along with the formatting issues, unless they changed the format of things like preface locations. However, all of this is personal preference. My wife really likes her Baronius and I'd rather go without than ever touch it. The '48 - '62 Ideal Missal original (and source of 1-3) has the smallest headings and margins, tightest spacing, identical sized Latin and English, with the Angelus having somewhat larger margins, nearly identical Latin-English font, and the Baronius having the widest margins and more generous spacing, with overly small Latin font and much larger English font (which made following the Mass harder to follow as priest and server will be using the Latin I'm trying to read from the Baronius). 1. Ideal Missal, 1948,, 2. Angelus Missal, 2004, 3. Baronius Missal, 2015 4. St Andrew's Missal, 1940-1947. The St Andrew's Missal is one I prefer to them all simply for the detailed explanation for each Sunday which fully integrates explanation of the Office for that day, plus the historical and scriptural setting for each part of the liturgical year. I have two different editions of the Baronius, the 2014 and the 2017. The latter of the two is much smaller in width and more codusive to single hand holding. I plan on getting a St. Andrews Missal now, too, for the pre-1955 Holy Week. Unless there is another Missal that someone here would recommend in place of the St. Andrew's? There is Fr. Lasance's The New Roman Missal.